Fortress Mountain has 0 runs serviced by 0 lifts. Backcountry terrain is accessible. Fortress terrain park contains features. This mountain about an hour out of Calgary is one of the best little big mountains around, and in my mind the closest legitimate mountain to Calgary. 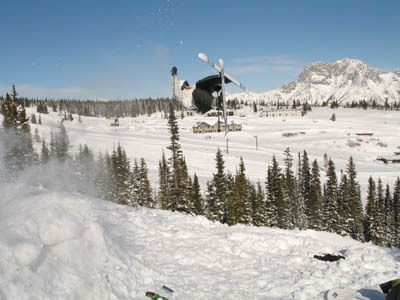 The resort itself is located in the Kananaskis Region of Alberta, which is about 25 km east of the B.C./Alberta border and in the most easterly part of the Rocky Mountains. This location at the edge of the Rockies provides Fortress with quite a bit of snow, usually more than any of the other mountains in the Banff area and often times when the Banff resorts don't get any at all. The terrain here is located on two different mountain ridges and for the most part is fairly wide open with just a few areas having trees to thick to ride through. The front side of the mountain is where you will find the trees to thick to shred, but once you get on the back or far side of the resort you will find fewer trees and some interesting gullies to shred. There is plenty of backcountry to explore here as the resort is located in the lower portions of some huge mountains, but be careful because the consequences are even bigger than the mountains. Fortress is a good option if you are in Calgary and looking for a laid back resort to get away from the crowds and enjoy some fresh tracks, if it ever re opens that is.